LDA is finally in action against the housing schemes it identifies as illegal and warned several times. 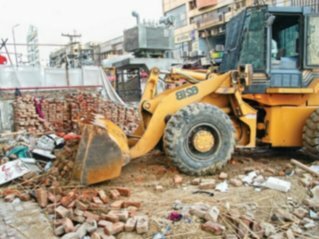 The LDA's Metropolitan Planning Wing demolished the entrance gates of a few such housing societies located on Ferozpur Road. The site offices of these societies have also been sealed. According to details, the action has been taken against Al Rehan Gardens and Al Hassan Gardens Kahana Ferozepur Road, and Anwer Twon, Katcha Ferozepur Road on 27th June, 2012. The officials have also sealed the site office of the said societies so that people don’t invest their money in these illegal societies. To educate the masses about investing in the right housing society, LDA has advised them to confirm its status from One Window Cell of LDA office in Johar Town. For the convenience of those who have internet facility, the LDA's official website also contains information about the housing societies that have been approved by the authority.